The lotus flower represents purity,exude beauty and grace. Beautiful minimalist flower ear jacket stud earrings are perfect for a bridesmaid gift,best friends gift,Mother's day, Valentine's day, Christmas, Wedding jewelry, Birthday gift. 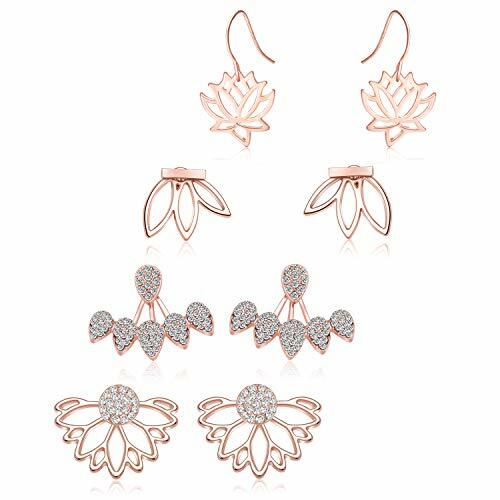 These lotus flower jewellery are made of environmental alloy materials and some clear crystal,hypoallergenic,lead-free,nickel-free.Comes with matching 1 pair stainless steel butterfly backs,Lightweight and comfortable for everyday use. These studs earrings can be used as single stud earrings or stud with ear jackets,and can match with your many kinds of clothes,from work clothes to daily,party,event wearings, from shirt to dress,easy to show your elegance. 1) Keep it dry and avoid wearing it when bathing, doing housework and swimming. 2) Do not touch it often, grease and sweat on hands will caused corrosion. 3)Perfume is also corrosive to jewelry. Wear your perfume before putting on the piece. 4)Rub your Jewelry with baby wipes: they perform miracles on crystal jewelry. Then rub with a clean dry soft cotton cloth to bring back the shine. We provide 100% 30-day money back guarantee if you do not like the lotus flower earrings or any other reason.